First U.S. Wood Badge course director, author including Boy Scout Handbook, Boy Scout Fieldbook, Patrol Leaders Handbook, and articles for Boys' Life and Scouting magazines. William Hillcourt (August 6, 1900 – November 9, 1992), also popularly known within the Scouting movement as "Green Bar Bill" and "Scoutmaster to the World", was an influential leader in the Boy Scouts of America (BSA) organization for much of the 20th century, acclaimed as "the foremost influence on development of the Boy Scouting program." Hillcourt was a prolific writer and teacher in the areas of woodcraft, troop and patrol structure, and training; his written works include three editions of the BSA's widely circulated official Boy Scout Handbook, with over 12.6 million copies printed, other Scouting-related books and numerous magazine articles. Hillcourt developed and promoted the American adaptation of the Wood Badge program, the premier adult leader training program of Scouting. Hillcourt was Danish, but moved to the United States as a young adult. From his start in Danish Scouting in 1910 until his death in 1992, he was continuously active in Scouting. 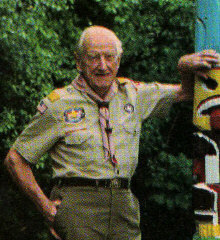 He traveled all over the world teaching and training both Scouts and Scouters, earning many of Scouting's highest honors. His legacy and influence can still be seen today in the BSA program and in Scouting training manuals and methods for both youth and adults. Hillcourt was born, the youngest of three sons of a building contractor, in Aarhus, Denmark, in 1900 under the name Vilhelm Hans Bjerregaard Jensen. Around 1930, he changed his name by anglicizing "Vilhelm", dropping "Jensen", and translating "Bjerregaard" into "Hill-court". His first published work was a poem about trolls and elves, printed by an Aarhus newspaper when he was nine years old. For Christmas 1910, Hillcourt's brother gave him a Danish translation of Scouting for Boys by Baden-Powell, the founder of the Scout movement. He went on to earn the highest rank in Danish Scouting, Knight-Scout in 1918, at age 17. He was selected to represent his troop at the 1st World Scout Jamboree in Olympia in 1920 where he first met Baden-Powell, with whom he was later to work. While Hillcourt studied pharmacy in Copenhagen, he became more involved in Scouting. As a Scout leader, he became a Scoutmaster, national instructor, writer and then the editor for the Danish Scouting journal. He wrote his first book, The Island, recounting his early Scouting experiences. Hillcourt's troop was set to participate in the 2nd World Scout Jamboree in Ermelunden, Denmark, when he obtained a position as a journalist covering the jamboree. He later became the managing editor of the paper's Sunday magazine. After deciding to experience Scouting around the world and to return home with the best ideas, Hillcourt worked his way through Europe and England and then arrived in the United States in February 1926. He was soon hired by the BSA's national office and worked for the BSA until he retired as a professional Scouter in 1965. In 1933 Hillcourt married Grace Brown, the personal secretary of Chief Scout Executive James E. West. Hillcourt worked at a BSA camp at Bear Mountain in Harriman State Park, New York, in 1926 where he became an instructor in American Indian dance. He then worked for the BSA Supply Division where he broke his leg when a crate fell on him. He met James West while working at the national office. West solicited Hillcourt's thoughts on Scouting in the U.S. Hillcourt later sent West an 18-page memo detailing issues with the lack of patrol structure and leadership. He recommended that the BSA write a handbook for patrol leaders, and that it needed to be written by someone who had been both a patrol leader and a Scoutmaster. West hired Hillcourt as a writer and editor and was later persuaded to commission Hillcourt to write the first Handbook for Patrol Leaders. From 1932 until his retirement in 1965, Hillcourt became a major contributor to Boys' Life, the magazine for Scouting youth. Each monthly issue included a page on advancement and Scoutcraft, outdoor Scouting skills, and included his signature superimposed over the two green bars that are the emblem of the patrol leader, which led to his moniker "Green Bar Bill" and its adoption as the logo of his regular Boys' Life column. Hillcourt was tasked to write a new manual for Scoutmasters in 1934 and worked with his good friend and colleague E. Urner Goodman, the national program director of the BSA. He and his wife moved to a house in Mendham Borough, New Jersey, to be near Schiff Scout Reservation, the BSA's national training center, so he could be in place to put this theories to a practical test. In order to do so, he founded Troop 1 of Mendham in 1935 as a unit directly chartered to the National Council of the BSA. 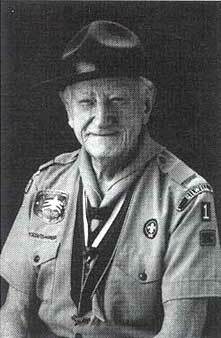 As the Scoutmaster, he used Troop 1 to test and validate his work for 16 years. The Baden-Powells visited Schiff in 1935 and began a steadfast friendship with the Hillcourts. Baden-Powell died in 1941. After World War II, Baden-Powell's widow, Olave Baden-Powell, allowed Hillcourt to edit Scouting for Boys and Aids to Scoutmastership into the World Brotherhood Editions to help the Scouting movement recover from the war. She then allowed Hillcourt access to all of Baden-Powell's letters, diaries and sketchbooks when she and Hillcourt co-authored the narrative biography of Baden-Powell, Baden-Powell: The Two Lives of a Hero. The national office moved from New York City to North Brunswick, New Jersey, in 1954, and the Hillcourts moved with it. He completed the sixth edition of the Boy Scout Handbook in time for the BSA's 50th anniversary in 1960. Template:Seealso To encourage the creation of Rovering in the U.S., J. S. Wilson travelled from the UK to oversee a Wood Badge course in May 1936 at Schiff. Hillcourt was a participant in that first course and four days later, he was the senior patrol leader for the second course. He received his Wood Badge beads in 1939 and was appointed as the deputy camp director for Wood Badge. After World War II, Wood Badge was revived and Hillcourt was the Scoutmaster for a test course begun on July 31, 1948, at Schiff and the first standard course at Philmont Scout Ranch. As the national director of training, Hillcourt wore five Wood Badge beads, a tradition that has been discontinued. In the year before his retirement on August 1, 1965, the national council began a program to update the Wood Badge program and shift its emphasis from teaching Scoutcraft to leadership skills. Although he was officially retired, his opinion was still sought after and respected. Dr. John W. Larson, Director of Boy Scout Leader Training for the National Council, was working with Béla H. Bánáthy and Bob Perin, Assistant National Director, Volunteer Training Service, to adapt the leadership competencies of the White Stag Leadership Development Program into a new Wood Badge syllabus. Hillcourt was among the few on the National Staff who strongly resisted the change to the Wood Badge program. He attended the presentation that Larson made to the national scout committee on the new Wood Badge curriculum. Larson later reported, "He fought us all the way ... He had a vested interest in what had been and resisted every change. I just told him to settle down, everything was going to be all right." Hillcourt presented an alternative to Larson's plan to incorporate leadership into Wood Badge. Chief Scout Executive Joseph Brunton asked Larson to look at Hillcourt's plan, and Larson reported back that it was the same stuff, just reordered and rewritten. Larson's plan for Wood Badge was approved and he moved ahead to begin implementing the proposed changes. Hillcourt retired from the BSA on August 1, 1965. In 1971, he and Grace finally completed the world tour he had started in 1926; along the way they attended the 13th World Scout Jamboree in Fujinomiya, Japan. Grace Hillcourt died in 1973.. Rather than live alone, Bill moved into the home of his good friends Carson and Martha Buck. The BSA had introduced the Improved Scouting Program in 1972, along with a new edition of the Boy Scout Handbook. Many of the changes were intended to expand Scouting to a broader base of youth and to make Scouting more "in tune with the times". Many Scouters, including Hillcourt, were critical of the new program changes, exclaiming that the de-emphasis on traditional outdoor skills had taken the "outing out of Scouting". This change proved to be unsuccessful. To remedy this situation, Hillcourt convinced Chief Scout Executive Harvey L. Price that a new handbook was needed. Hillcourt then came out of retirement and spent a year writing and editing the 1979 edition of The Official Boy Scout Handbook, returning to the focus of Scoutcraft. In addition, he helped to develop the All Out for Scouting program that launched the return to the old standards. Hillcourt was regarded as a prominent figure and guide in BSA's recovery from its experiment earlier in that decade. Hillcourt was recognized for his service to youth by the BSA with the Distinguished Eagle Scout Award on May 19, 1978. [note 1] In 1980, the BSA presented Hillcourt with their highest national honor, the Silver Buffalo Award and was cited as "The Voice of Scouting". The World Scout Committee of the World Organization of the Scout Movement recognized him for exceptional services to world Scouting in 1985 with the Bronze Wolf Award. In 1990 he also became a member of Firecrafter, an American Scouting service organization. Travel and appearances at Scouting events both local and worldwide were part of his routine until he died, earning him the sobriquet Scoutmaster to the World. Hillcourt died at the age of 92, in Stockholm, Sweden, while traveling on a Scouting tour with Carson Buck in 1992. He is buried with his wife Grace in St. Joseph's Cemetery in Mendham, New Jersey, at Row 8, Block I, near Mortimer L. Schiff Scout Reservation, where he had lived for so many years. His legacy in Scouting and his influence continue in the programs and training of Scouting. Consequently, his writings are still used within the Scouting movement and his material continues to be reprinted in Scouting magazine. The Longhouse Council operates the William Hillcourt Scout Museum and Carson Buck Memorial Library at Camp Woodland in New York to "keep the traditions of Scouting alive" through the preservation of the history that is a foundation for today's Scouting movement. Hillcourt was one of the BSA's most prolific writers. He wrote numerous articles for Boys' Life and Scouting magazines, including a column aimed at patrol leaders under the by-line of "Patrol Leader Green Bar Bill". At least 12,610,000 copies of his three editions of the Boy Scout Handbook were printed. ↑ When or if Hillcourt earned the Eagle Scout Award is uncertain. The official BSA DESA list shows that Hillcourt earned Eagle Scout in 1918—the year he earned Knight-Scout in Denmark—but he did not arrive in the U.S. until 1926. ↑ 1.0 1.1 1.2 1.3 1.4 Peterson, Robert (September 1985). "Bill Hillcourt—Still Going Strong on the Scouting Trail". Scouting: 26. ↑ 2.0 2.1 "Distinguished Eagle Scout Award". Boy Scouts of America. http://www.scouting.org/filestore/pdf/02-529.pdf. Retrieved July 21, 2010. ↑ 3.0 3.1 3.2 Peterson, Robert (January–February 2001). "America's Best-Known Scouter". Scouting. http://www.scoutingmagazine.org/issues/0101/d-wwas.html. Retrieved February 3, 2008. ↑ 4.0 4.1 4.2 4.3 4.4 4.5 4.6 Block, Nelson (1993). "William Hillcourt 'Scoutmaster to the World'". The Journal of Scouting History. http://www.trussel.com/prehist/crump/hillcour.htm. Retrieved February 3, 2008. ↑ Hillcourt, William (1964). "2nd World Jamboree Ermelunden, Denmark, 1924". Baden-Powell: The Two Lives of a Hero. Pine tree web. http://www.pinetreeweb.com/1924-jamboree.htm. Retrieved February 6, 2008. ↑ 6.0 6.1 6.2 Howerton, Terry. "Scoutmaster to the World". Scouter.com. http://www.scouter.com/features/0290.asp. Retrieved February 3, 2008. Includes "The Life of a Serendipitist", an autobiographical sketch by William Hillcourt. ↑ 7.0 7.1 Holleran, Robin Suerig (October 2006). "Green Bar Bill's Own Troop". Scouting. http://www.scoutingmagazine.org/issues/0610/d-wwas.html. ↑ van Gelder, Lawrence (February 4, 1979). "A Work of Love for 'Boy Scout,' 78" (PDF). The New York Times. http://query.nytimes.com/mem/archive-free/pdf?_r=1&res=F60D10F7395511728DDDAD0894DA405B898BF1D3. Retrieved February 4, 2008. ↑ Rowan, Edward L. (2005). James E. West and the History of the Boy Scouts of America. Las Vegas International Scouting Museum. ISBN 0-9746479-1-8. ↑ Associated Press (November 14, 1992). "William Hillcourt, A Boy Scout Writer And Columnist, 92". The New York Times. http://www.nytimes.com/1992/11/14/obituaries/william-hillcourt-a-boy-scout-writer-and-columnist-92.html. Retrieved February 19, 2008. ↑ 11.0 11.1 Hillcourt, William; Baden-Powell, Olave (1964). Baden-Powell: The Two Lives of a Hero. Irving, Texas: Boy Scouts of America. ISBN 0-8395-3594-5. ↑ Walker, Johnny. "Bibliography". "Johnny Walker's" Scouting Milestones. http://www.scouting.milestones.btinternet.co.uk/books.htm. Retrieved February 18, 2008. ↑ 13.0 13.1 "History of the Boy Scout Handbook". Troop 97. http://www.troop97.net/bshb1.htm. Retrieved February 6, 2008. ↑ "'Green Bar Bill' and Wood Badge". Wood Badge history. Archived from the original on March 3, 2008. http://web.archive.org/web/20080303005806/http://www.woodbadge.org/wbgbbWB.htm. Retrieved February 6, 2008. ↑ Walker, Johnny. "The origins of the Wood Badge". "Johnny Walker's" Scouting Milestones. http://www.scouting.milestones.btinternet.co.uk/woodbadge.htm. Retrieved February 18, 2008. ↑ 16.0 16.1 16.2 Miyamoto, Alan; Joe St. Clair and Brian Phelps. "White Stag History Since 1933". White Stag Leadership Academy. http://www.whitestag.org/history/history.html#1965. ↑ Peterson, Robert W. (1984). The Boy Scouts: An American Adventure. American Heritage. ISBN 0-8281-1173-1. ↑ "2007 Silver Buffalo Awards for Distinguished Service to Youth on a National Level". Boy Scouts of America. http://www.scouting.org/Awards/SilverBuffalo.aspx. Retrieved February 6, 2008. ↑ Murphy, Kevin (2001). "Readable Graves in St. Joseph Cemetery". St Joseph's Catholic Church Cemetery. Archived from the original on June 14, 2006. http://web.archive.org/web/20060614161714/http://ftp.rootsweb.com/pub/usgenweb/nj/morris/cemeteries/stjoseph.txt. Retrieved August 3, 2006. ↑ "Green Bar Bill Hillcourt". The Ultimate Boy Scouts of America History Site. Randy Woo. Archived from the original on February 14, 2008. http://web.archive.org/web/20080214043028/http://users.aol.com/randywoo/bsahis/bill.htm. Retrieved Jul 21, 2010. ↑ Gardner, Lew (Issue 75, Spring 1993). "Green Bar Bill Passes at Age 92". Boots and Blisters. ↑ "Archives". Scouting. http://www.scoutingmagazine.org/archives/greenbar.html. Retrieved February 5, 2008. ↑ "William Hillcourt Scout Museum and Carson Buck Memorial Library". Longhouse Council. http://cnyscouts.org/museum/. Retrieved February 8, 2008. ↑ 24.0 24.1 24.2 24.3 "BSA Handbook". Library Thing. http://www.librarything.com/work/203231/editions/. Retrieved July 31, 2011. ↑ Hillcourt, William; West, James E. (1933). The 1933 Scout Jamboree Book. Boy Scouts of America. http://www.pinetreeweb.com/1933-wj4-sjb-introduction.htm. Retrieved February 4, 2008. ↑ Hillcourt, William (1952). Handbook for Patrol Leaders (World Brotherhood Edition, 3rd print ed.). Boy Scouts of America. ↑ Hillcourt, William (1977). Norman Rockwell's World of Scouting. Harry N Abrams. ISBN 0-8109-1582-0. ↑ Hillcourt, William (1980). The Official Boy Scout Handbook. in association with the Boy Scouts of America (Ninth edition, 3rd print ed.). Boy Scouts of America. ISBN 0-8395-3227-X. ↑ The Official Patrol Leader Handbook. contributions by Hillcourt, William; Monroe, Keith. Boy Scouts of America. 1980. ISBN 0-8395-6512-7. These articles are appearing every month on the front page. The amount can be expanded to 53 articles, if necessary. The wikicode on the front page then has to be altered from MONTH to WEEK. This page was last edited on 10 October 2015, at 13:46.